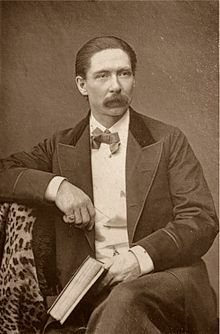 Featured in this week’s History of Magic is John Nevil Maskelyne, who was born in Gloucestershire, England in 1839. His list of accreditation’s describes him as a magician, escapologist, inventor, author and paranormal investigator. He trained as a watchmaker and developed a real skill with clockwork and mechanical devices. His interest in magic came about by watching the famous Davenport Brothers present their so called spirit cabinet illusion. With his friend George Cooke a cabinet maker, they worked out how the spirit cabinet effects worked and then built their own cabinet exposing the Davenport brothers in 1865 as frauds. This inspired both Cooke and Maskelyne to both become professional magicians. The early years were financially hard, till a theatrical agent William Morton offered to finance a tour of England. They became a firmly established act that included a long term engagement at the renowned Egyptian Hall in London’s Piccadilly. In 1894 Maskelyne wrote the book Sharps and Flats, the complete revelation and secrets of cheating at cards and other games of skill. Even today the book is read by card sharps and magicians alike. Maskelyne authored many books dealing with conjuring and magic tricks. 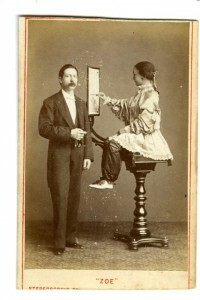 In collaboration with Cooke they developed a number of fine illusions, many of which are still in use today but are best known for their levitations. American magician Harry Kellar actually stole this illusion by bribing Maskelyne’s technician. After his partner Cooke passed away, he teamed up with David Devant to continue performing at the famous Egyptian Hall. Nevil Maskelyne became a member of the London Magic Circle and like Houdini tried to dispel the notion of supernatural powers being responsible for spirit phenomena. In 1914 he set up the Magic Circle Occult Committee that investigated claims of supernatural powers. However they never discovered anybody that could prove beyond doubt what they did was paranormal. Through lack of evidence ever being discovered, the Occult Committee was dissolved some years ago, just as have most other parapsychology societies around the world, through lack of any scientific evidence to support claims. Maskelyne also wrote prolifically on exposing spiritualism and Theosophy. While a member of the Magic Circle, he also attempted to prove that the fabled Indian Rope Trick was in fact a myth and for many years a sum of 1000 Pounds was offered to anyone who could perform this trick outdoors. No one ever came forward to perform it or claim the money. The Indian Rope Trick to this day remains a fascinating enigma although it was sometimes performed on stage. As well as becoming a very accomplished performer on stage and presenting illusions he invented a number of mechanical devices. The most notable was the first British Typewriter and Brass Door Lock on London public toilets that required the insertion of a penny to operate the door. These toilet door locks were found throughout the British Empire and I remember seeing them back in the 1950’s. These brass door locks led to the saying to “Spend a Penny”. 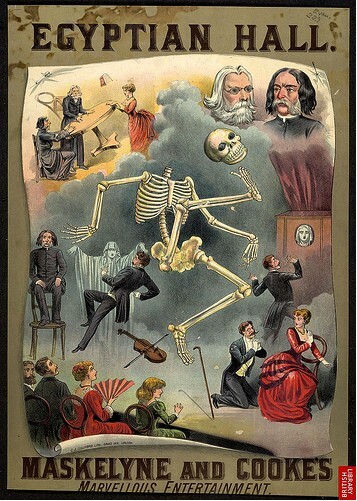 As in many cases throughout magical history it is seen that many professional magicians were multi-talented, as performers, showman, authors and entrepreneurs. Perhaps less known is that many famous magicians gave generously to charitable institutions and fellow performers acting as benefactors. This is a trend still followed today by fellow magicians who sometimes take care of their brothers’ welfare or health by donations. This is a very noble and often seldom mentioned gesture by many. Perhaps some mention could be made here of the Egyptian Hall that became synonymous with Nevil Maskelyne and David Devant’s magical career there. The Hall was built in 1812 and its interior was designed on classical, ancient Egyptian architecture mainly as a museum and exhibition hall. It initially housed curiosities and artefacts from Captain James Cooks voyages of discovery, then an exhibition of Napoleonic era relics including Napoleon’s own captured carriage. The Egyptian Hall became the repository for art exhibitions and many entertainment productions because of its large size. Towards the end of the 19th century it became associated with magicians and spiritualists who both presented their performances there. The Hall also became the venue that showed the very first films in England called animated photographs. At the turn of the century the Maskelyne family took control of the beautiful and unique building that became known as ‘England’s Home of Mystery’. Sadly the Egyptian Hall was demolished in 1905 to make way for a large apartment complex at 170-173 Piccadilly that is remembered by all magicians for its historical significance to John Nevil Maskelyne. One very special skill he developed was plate spinning where china dinner plates were spun on a table top creating an aura of clever dexterity and manipulation. It is doubtful whether this act is ever seen today, so a lesson to be learnt is for someone to recreate it. There is an old video clip on YouTube, only for a few seconds that shows Maskelyne actually spinning the plates by hand that is quite delightful and very unusual and required real skill. Early records show that an English magician called Signor Blitz first introduced the spinning plates in an act he called ”The Waltzing Plates” with music around 1849 in the U S A.
Maskelyne also became involved in cinema photography at the Egyptian Hall and designed and built a number of Automatons namely ‘Psycho’ the mechanical card player, and ‘Zoe’ the little girl who could draw pictures. These were marvellous clockwork apparatus built in an era far removed from electronic gimmickry and are today still mysterious and wonderful mechanical curiosities. Fortunately they have been lovingly restored for posterity. Maskelyne passed away in 1917 but his clever accomplishments remain part of history (including the history of magic) even in our modern technological age. I am proud of the fact that he was the first Patron of the South African Magical Society that I belong to.